BELOW: Video of Super Science Day at Dicken Elementary; see a video segment on how to make your own Oobleck. 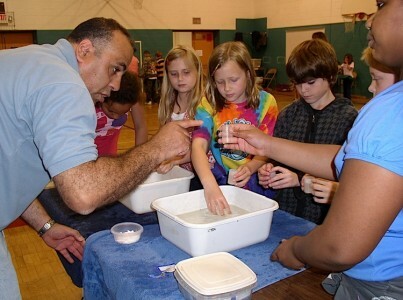 It was all hands on deck during the Dicken Elementary School Super Science Day May 21, where members of the Ann Arbor Hands-On Museum staff and parent volunteers showed students just how much fun science can be. Parent volunteers work with Dicken students during Super Science Day. Hands-On Museum staffer Brian Cressman was challenging fourth- and fifth-graders at the Matter A Changin’ station, exploring the use of solids and liquids to create gases. One of the most popular was Oobleck, which uses a mixture of corn starch and water that can exhibit properties of both a solid and a liquid. Parent Tina Zrull, who has a 6-year-old at Dicken, was running the Oobleck table and having just as much fun. “I didn’t get to be a kid until now,” she quipped. Among the 10 stations were Antacid Launch in which plastic canisters are launched into the air, Centripetal Swing in which water in buckets in swung around without spillage, Up Close and Personal using microscopes and Estuary Larry in which students recreate an estuary, where of salt and fresh water meet. Activities took place in the school gym where students rotated through though the experiments in groups, spending 5 minutes at each activity station trying the experiment on their own. “Hopefully it will get our kids excited about science,” Shakour added. Dicken kindergartners had their own Super Science Day on May 26, allowing them to enjoy age-appropriate science activities and work in smaller groups.